My hair has been drier than ever this winter in the lengths and ends, and I've really noticed it looking more damaged. 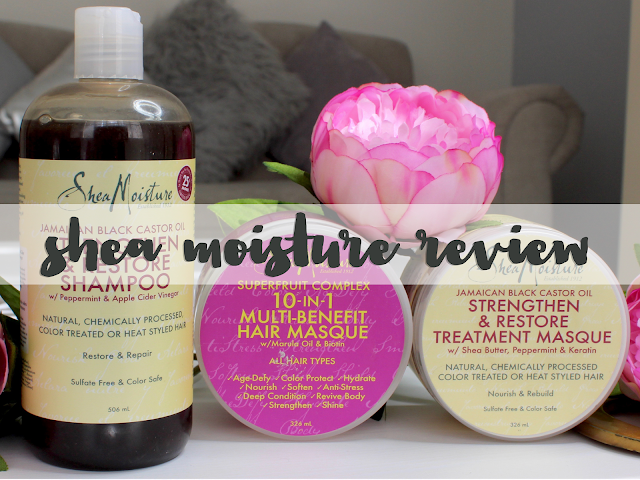 For the first time I think I'd actually class my hair as brittle, and it's been prone to breaking, so the ideal time to be trying out some of the Shea Moisture range seeing as it's named 'strengthen and restore'! I've been giving the Shea Moisture Strengthen and Restore shampoo a try alongside the matching treatment masque. 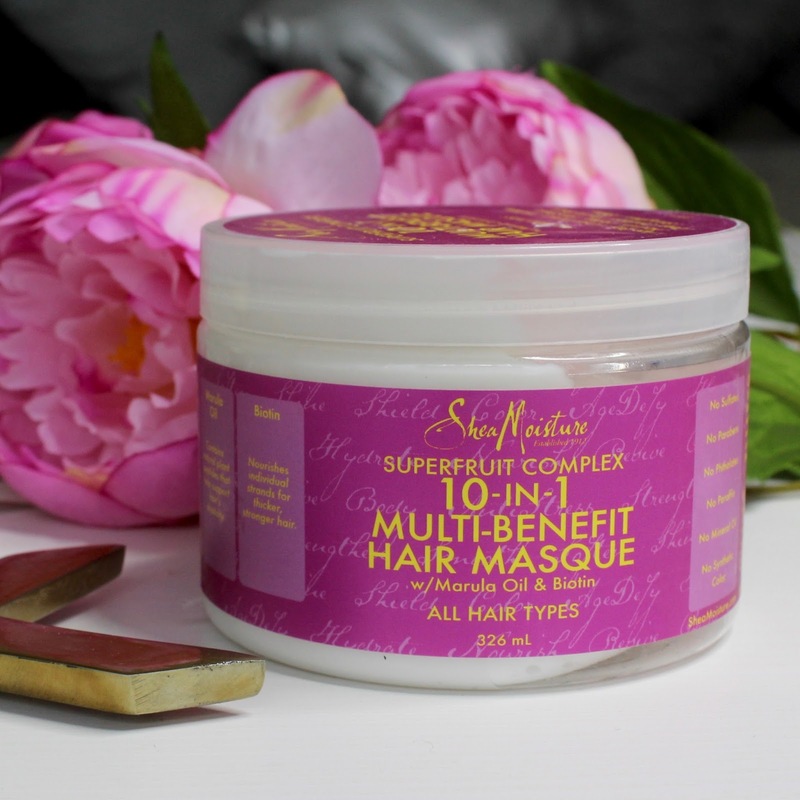 Plus I've also been alternating with the Shea Moisture Superfruit Complex 10 in 1 multi-benefit hair masque. 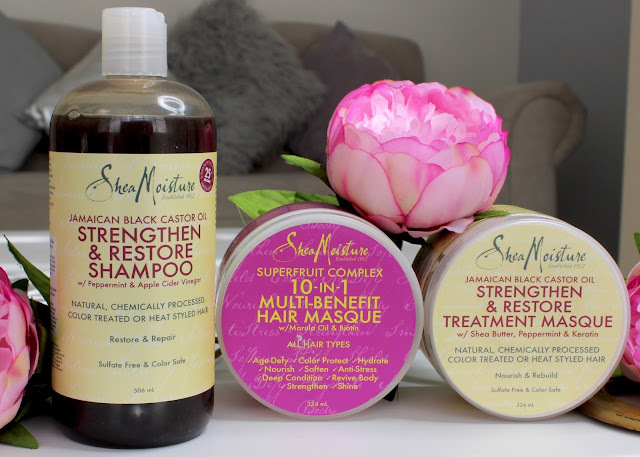 If you've not come across the brand before you might be pleased to know that Shea Moisture is a natural, organic, cruelty-free brand. Their products don't contain any sulphates, parabens, mineral oils or synthetic colours or fragrances. 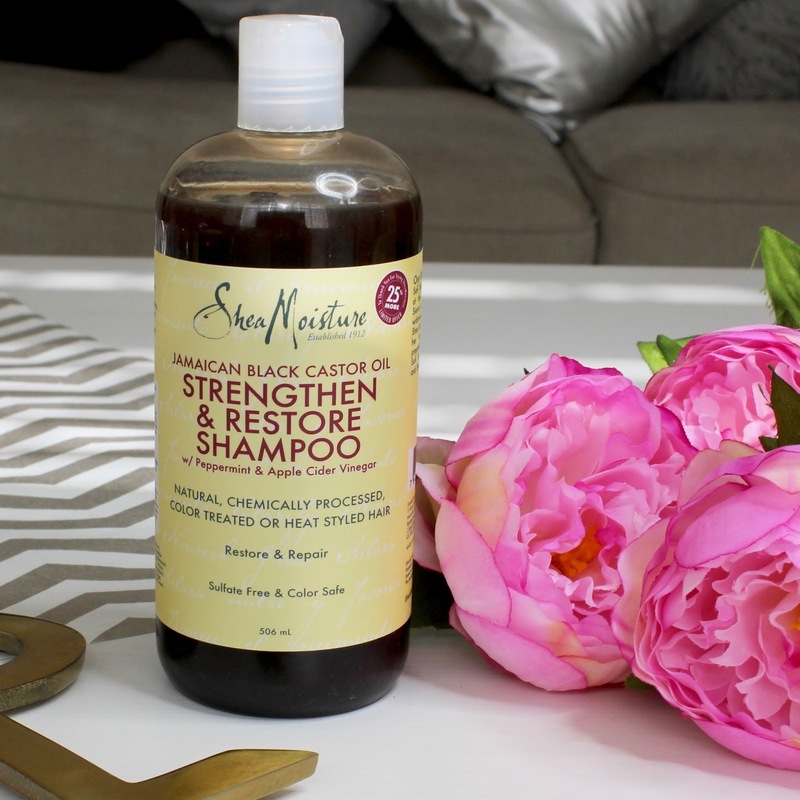 Jamaican black castor oil, which is the star ingredient in the Strengthen and Restore products, is particularly suited to afro hair because it's so nourishing, and I was also interested to find out that it encourages hair growth too. This ingredient and range is good for all types of dry and damaged hair, and although I have very greasy roots, the shampoo didn't overload my hair and still left it feeling really clean, which surprised me. I've now realised this is because of the balance of ingredients - alongside the black castor oil the product also contains apple cider vinegar to clarify and balance the scalp. Both hair masques are sweet smelling and super thick and rich. After shampooing and rinsing I've been squeezing as much water from my hair as possible before applying the masque all over my hair but avoiding the roots and then clipping the hair up and leaving it while I lounge around in the bath. I've also tried, as suggested on the tub, covering the hair in a shower cap and applying heat from a hair dryer before rinsing. 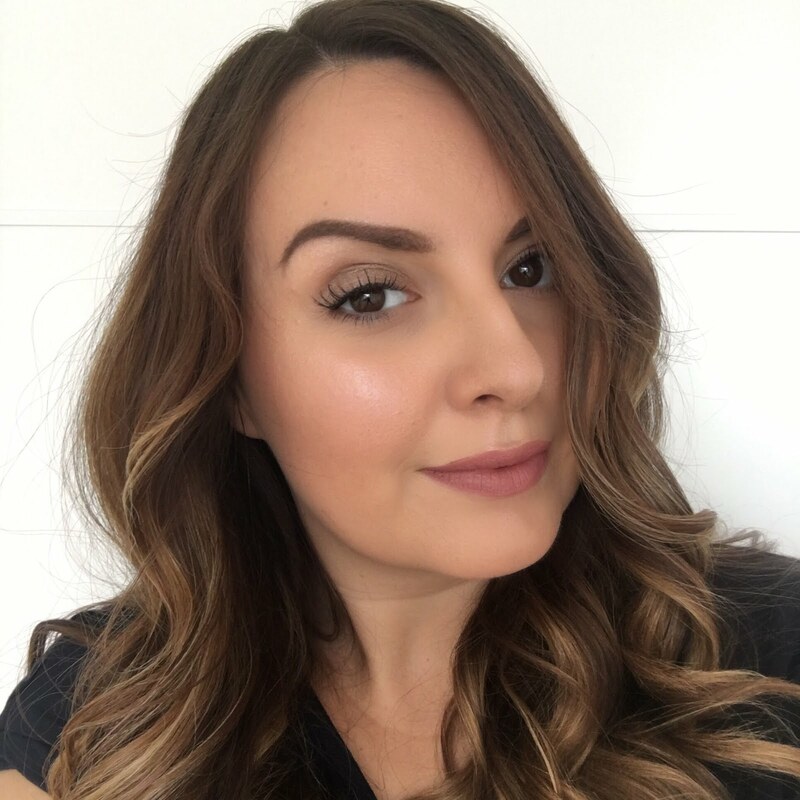 It's a bit of faff and extra effort, but it really intensifies the efficacy of the products, and left me with super soft and shiny hair. 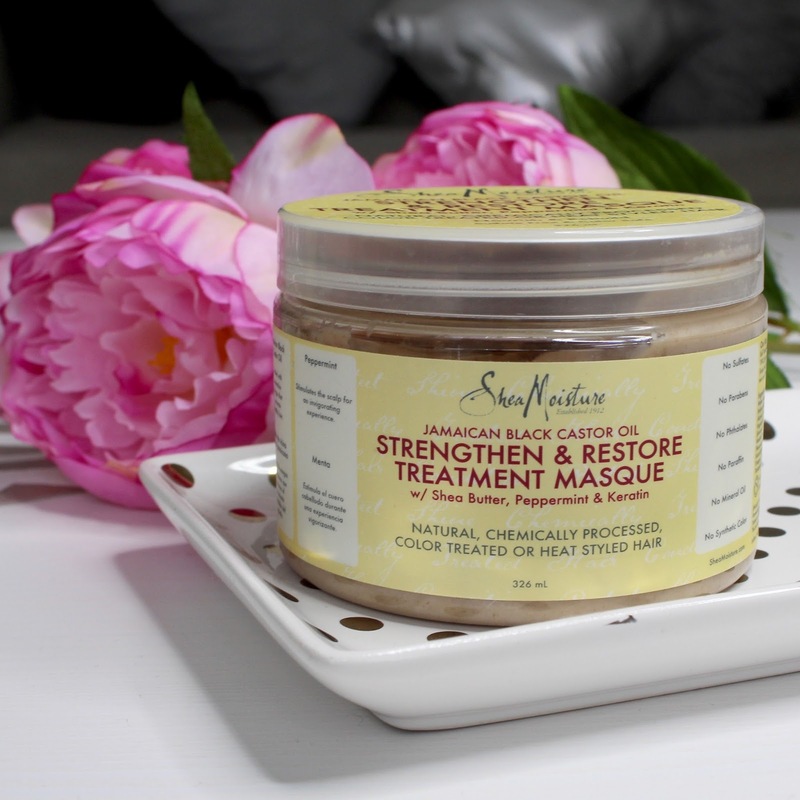 Personally I found both masques quite similar other than in scent and appearance - they each gave my hair a much needed boost of moisture, leaving it deeply conditioned and feeling stronger. I have a slight preference for the Superfruit masque because it smells gorgeous! Although I have greasy roots, these conditioning masques work perfectly for me on the lengths of my hair as you rinse them out completely - there's a leave in conditioner version in the range which I don't think would work for me, so I'll be sticking to the once a week conditioning treat instead. I'm really happy with the shampoo, but it's the masques that have really impressed me, and they're certainly something I'd repurchase. The Shea Moisture range is available now at Boots priced from £10.99, and there's currently a 3 for 2 offer.